I love my ring. 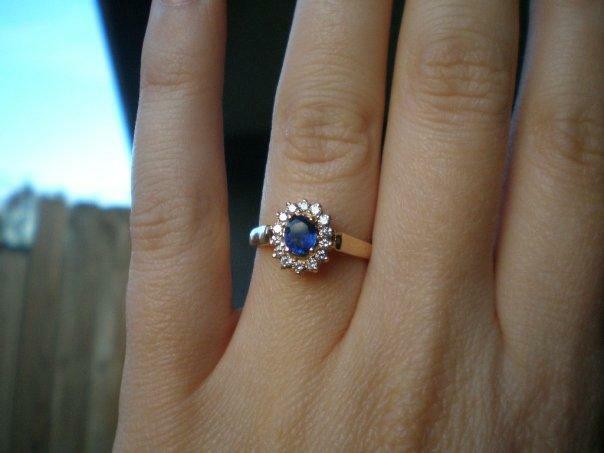 It’s yellow gold with a blue sapphire and halo of diamonds. 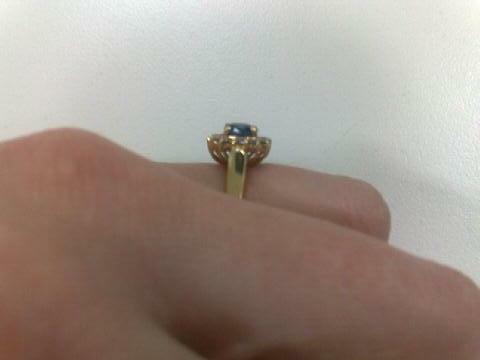 It’s also a (smaller) copy of Princess Diana’s ring. I was on holiday with a friend in Jaipur, India in November 2008 when I saw this ring in a shop – I emailed a picture of it to The Groom and he said ‘get it!’. I, of course, obliged, and spent the next couple of weeks guarding it while travelling around India. But I’m having issues trying to find a wedding band that fits it. The problem is there is no space underneath the crown-thing (sorry, I don’t know any technical terms when it comes to rings!) for a wedding ring to sit flush against the e-ring. I’ve been to several jewellers, chain stores and boutique. One has suggested a plain gold band made very thinly on the top so it can sit under, but that might wear it away over time. Another has suggested a curved band to sit around it, but I feel that looks bulky. The wedding ring is a tradition I want to keep, I just need to find one! Maybe if you get the thin band to attach to the engagement ring it will have less chance of wearing away? As you know, my ring is similar and I managed to get a band to sit under it just fine but maybe this is because my engagement ring is a little big… maybe you just need to enlarge the ring size? Having a thinner band and attaching it to the e-ring might be best! You could easily just slot a thin band in I reckon! Ooh gorgeous! As soon as I saw it I thought of Princess Diana’s ring 🙂 And I’m not sure about a suggestion for the wedding band but what did Diana have? The jeweller yesterday also suggested looking at what Diana had – she appears to have had a plain band, but the second picture on that link looks like they don’t sit flush with each other. Mine don’t sit flush with each other (as you know)… are you dead set on having the rings sit flush against each other? I think sometimes it looks nice when they are two separate rings! Mine is almost exactly the same! My fiancé had mine made at Percy Marks. I’ve been tossing and turning about wedding bands and wanted something with a little sparkle. Thanks Elissa! That Tiffany ring is gorgeous – having both on either side will be stunning.